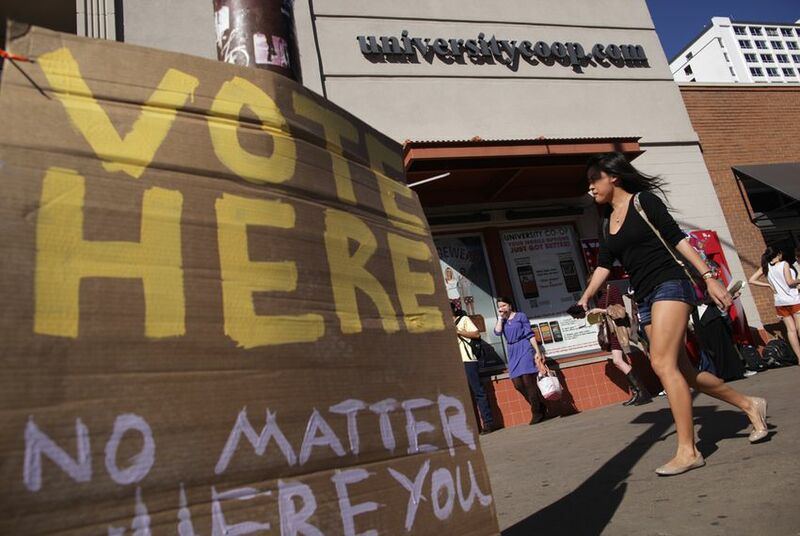 A result in the October 2012 University of Texas/Texas Tribune Poll finding a razor thin majority supporting, at least in concept, the federal pre-clearance of changes to the electoral system in some states mandated by Section 5 the Voting Rights Act of 1965 raised a few eyebrows. We revisited the question in the February 2013 survey with an eye toward checking to see if intervening events might have had an impact on public opinion, and to see if asking our respondents to consider Texas’ position in the VRA regime more specifically might influence those responses. The February results suggest that the answer to both of these inquiries is yes. We gave the same question we asked in October 2012 to half the respondents (600) in the February 2013 UT/Tribune Poll. We found that in the four intervening months, support for the substance of Section 5 had declined while opposition had increased. Overall support for the principle of pre-clearance fell from 51 percent to 44 percent, and opposition increased from 36 percent to 40 percent. Though these changes are within the margins of error for the two samples, there are plausible reasons to expect a shift in public opinion. As I wrote in a post in the lead-up to the U.S. Supreme Court’s review of the pre-clearance provisions found in Section 5 of the Voting Rights Act, the level of support in October conveyed a partisan distribution of support: Democrats strongly supported continued federal oversight (81 percent were in favor) and Republicans mostly opposed it, though less overwhelmingly (63 percent). Since October, the re-election of President Obama, the increasingly partisan discussion of laws regulating elections and the partisan discussion of the Shelby County case in the run-up to oral arguments probably contributed to a strengthening of Republican skepticism about the pre-clearance procedures being attacked by the Shelby plaintiffs. While the changes in overall support between October and February are not statistically significant variations, there were still noticeable shifts among Republicans that are likely signs of real movement in public opinion. Support for Section 5 fell 7 points among Republicans and opposition increased 6 points. Democratic support also fell 6 points, but opposition stayed steady, suggesting that the Democratic shift is probably more likely a statistical blip. We designed a variation of this item for the other half of the sample to see if a direct reference to Texas affected the responses. We were curious if the language in the original item referring to “some states” might be leading Texans to express support for federal supervision without thinking directly about the federal involvement in Texas. While states’ rights and/or Texas nationalism didn’t lead to a wholesale abandonment of voting rights enforcement, the Texas prompt generated more opposition to federal supervision compared to the generic reference to “some states.” Support dipped only slightly from 44 percent to 41 percent, but opposition jumped from 40 percent to 47 percent — moving the net support for continued electoral supervision (i.e., the difference between support for federal supervision and opposition to it) from +4 to -6 percent. 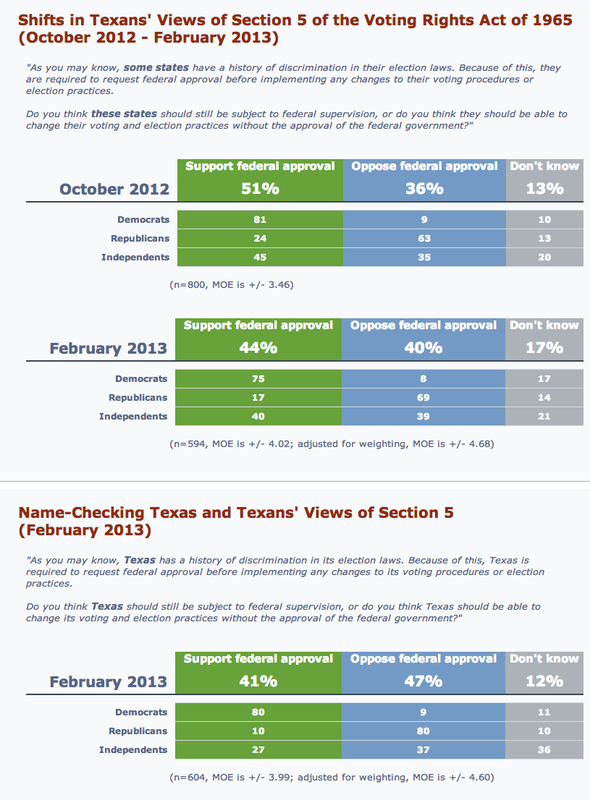 Republican respondents were very sensitive to the Texas wording compared to their Democratic counterparts. The net support for federal supervision among Democrats dropped slightly, from +72 to +67. Republican rejection of federal supervision, already strong, became even stronger with the Texas specification — net support for the current VRA regime dropped 13 percentage points, from -39 to -52. When federal supervision of the electoral process is placed squarely in the context of oversight of Texas, opposition is so widespread among Republicans — 80 percent of Republican identifiers rejected federal supervision of electoral changes in Texas — that they pull the aggregate numbers toward opposition to federal supervision by a 6-point margin. This big surge in Republican opposition, when you get down to the brass tacks of federal supervision here and its negative impact on overall support, will probably help reorient those who looked at the support for Section 5 in the October poll as some kind of anomaly. For some it was perhaps a pleasant surprise, for others an unwelcome sign of change. I think of these results less as a reassertion of some normal state of things and more as an illustration of how sensitive attitudes about fundamental institutional arrangements like federalism and the conduct of elections are to partisan framing and plain old state-chauvinism. It’s easy to admit that those other states need some federal oversight, but here in Texas? Get out of town.